Last week was Joseph Chamberlain College’s Citizenship Week. Where each day was dedicated to the fundamental British values. A number of subjects became involved as they looked further into The Rule of Law, Democracy, Individual Liberty, Mutual respect and Acceptance of Different Faiths & Beliefs. Throughout the week there were visitors who graciously gave their time to talk about specific relevant subjects. Dr Michael Naughton from the University of Bristol came to discuss the miscarriages of justice, he discussed wrongful convictions and the impact that it can have on the public. Tania Basset from the National Association of Probation Officers gave a speech about Women in the criminal justice system. Yasmin Devi-McGleish from the University of Wolverhampton discussed rehabilitation of offenders with restorative justice. Staff and Students also hosted their own events for the week. Students had the opportunity to advertise petitions that they felt strongly about and gain signatures, some staff and students engaged in a litter pick around the College and a meditation session was held after College hours to teach staff and students how to relax during the exam period. Amnesty international society hosted a talk about the sales of arms in Saudi Arabia and offered information and advice into how we can make a difference. The Greenhouse Club discussed the world’s food shortages and what could be done to prevent them. There was a debate regarding the freedom of speech on the internet, a film screening of ‘The Fifth Estate’ took place, a film based on the WikiLeaks founder Julian Assange and the creation of an encryption website which allows government secrets to be shared globally. The sports department also joined in by raising awareness regarding disabled sports and hosting a ‘blind’ football sessions, where players were blindfolded and had to use a sound making ball. Fifteen students visited St John & St Martin R C Church to understand other faiths and See Christian’s worship place and compare with other faiths to promote respect and understanding. 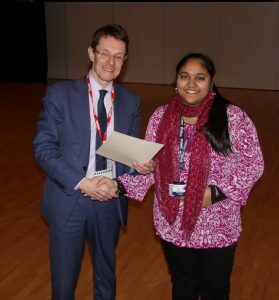 The College also had a competition named ‘If I Were Mayor’, where students had the opportunity to submit a policy that they would create if they became mayor. This was held from Monday to Wednesday and there were some fantastic submissions. The winner of the competition was announced on Friday 10th by Andy Street, a candidate for the next Mayor of the West Midlands. Student Parsa Ahmed was the winner of the competition with her policy to provide free sanitary items to the homeless. Parsa won a Love2Shop gift certificate for her first place prize.